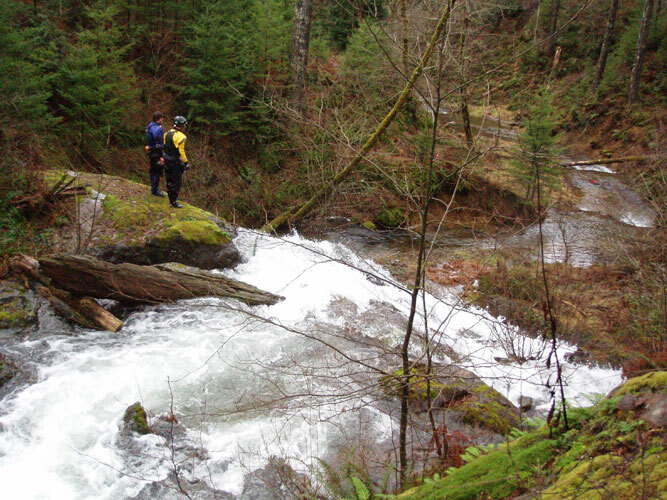 Pete and I had long been interested in the Washougal drainage in Washington, especially runs like the NorthWest Fork and Stebbins Creek. In the past, it was tricky to determine if anything was running in this drainage because there was no gauge. 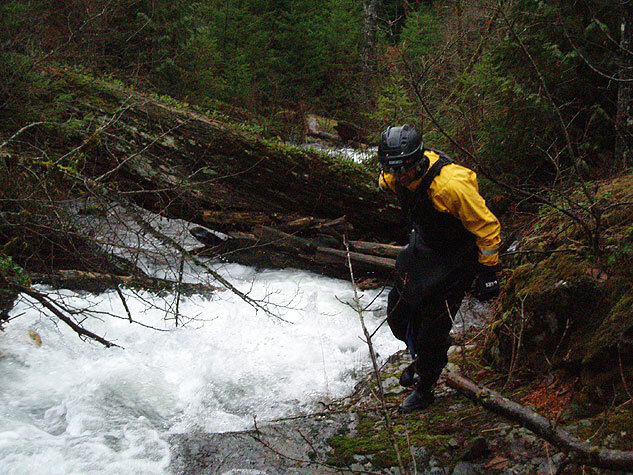 All of that changed in 2005, when the Washougal at Washougal gauge went online, instantly transforming the Washougal drainage from a hydrologic black hole to realistic destination. 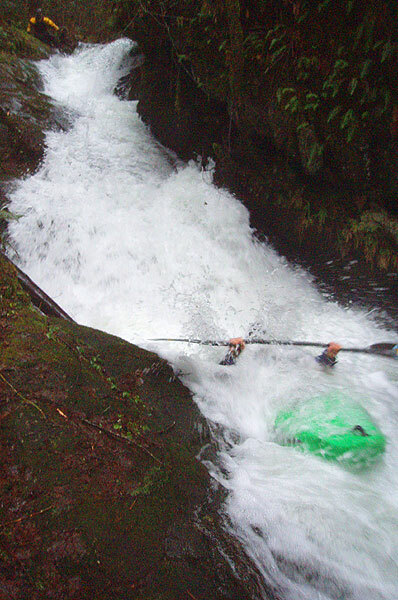 On a recent run down the NorthWest Fork in late 2005 we had taken note of two tribs we passed on the run, Wildboy Creek and Jackson Creek. Both of these tribs had big bedrock slides where they joined the NWF, so we were intrigued. All we needed was rain, and the weather cooperated in a big way by flooding on New Year's weekend. 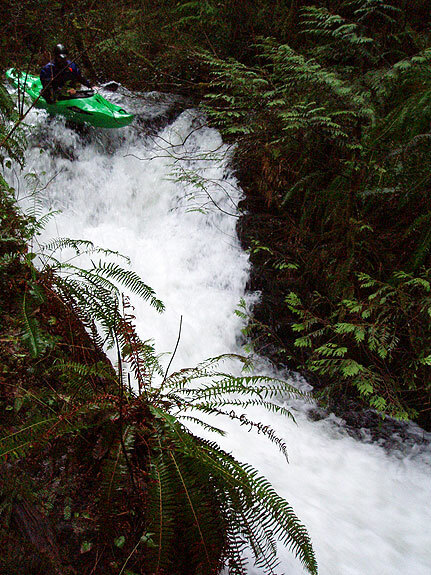 Pete and I hit Wildboy Creek on Friday, then we looped Michael Long in on the exploratory run down Jackson Creek, which was much steeper and possibly more interesting. The maps showed what appeared to be a path near the top of Jackson where we planned to put in, so we ended up wandering around for awhile until we found that the path was actually a pretty good quality road. We were pretty pleased by this and happy that we could drive right to the put-in bridge. After running shuttle ( we planned to take out down on the NorthWest Fork ) we suited up and dropped in, not really knowing what waited downstream. 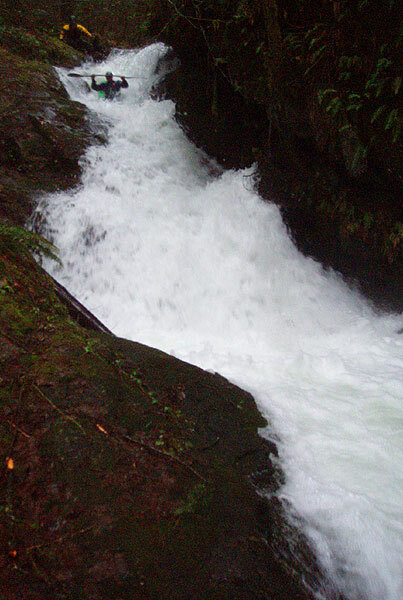 The creek immediately went into a small gorge and dropped over a 15 foot falls which was totally choked with wood. We portaged this drop with some difficulty on the right by climbing up and around, then climbed back in and put in at the base of the falls. 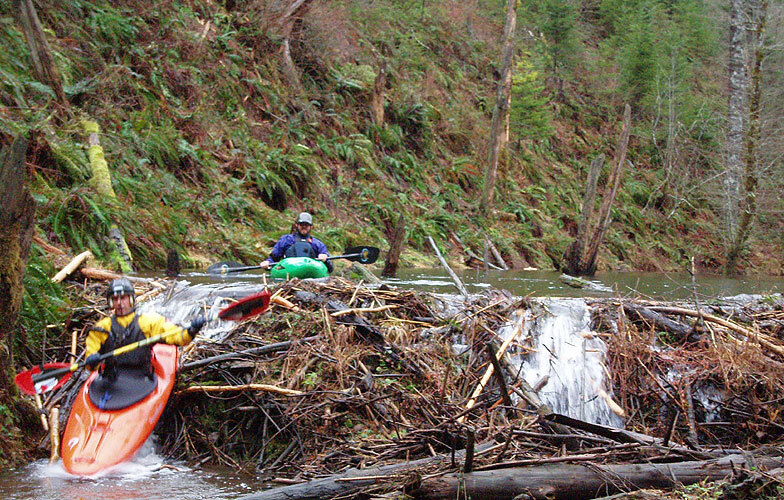 We headed downstream, ran a couple of small drops, then had a tight portage around an ancient old growth log.. Immediately below this portage we glimpsed a monster horizon line, and we sketched across the current to an eddy to scout.. 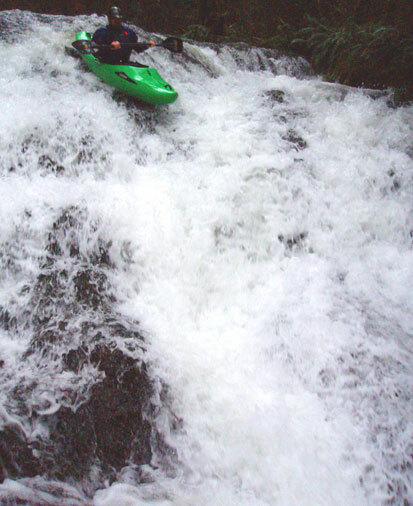 This huge, cascading drop ( dubbed 'The Hand of God' because it kinda looks like a huge hand, plus if you run it and screw it up you'll get the big smackdown if you know what I mean.. ) was marginally runnable down the right side and impossible down the left side due to shallow landing. Mike scouted the right side for awhile ( which careens of the wall ) and decided he didn't want to deal with the mangle potential so he walked it..
Below this huge gradient loss, the creek turtled up on us and got totally, utterly flat. We soon figured out what was going on when we reached first one then a second large beaver dam, both of which were runnable.. Immediately below the cascade, you enter beaver city. All of the beaver dams are runnable..
Below the beaver dams the creek immediately started off again with another ledge, then it got incredibly narrow and started sprinting around some incredibly tight corners with wood. This section would be horribly dangerous at high water, probably not runnable, so bear that in mind if you come in here with a bunch of water! There were more tight ledges in this middle section, and then we encountered a much more significant horizon line which we got out to scout. This drop ( named 'Countdown' by Mike, who ran it first ) had a log in the bottom, so we broke out the ropes and wrestled it out of the way so the drop was actually doable. Mike fired it off, without problems! Mike Long enters 'Countdown'. We had to move some wood around to make this drop runnable..
Below Countdown, more wood, mixed in with some really sweet falls and ledges. It was depressing how much wood there was on this one, because the drops have quality. 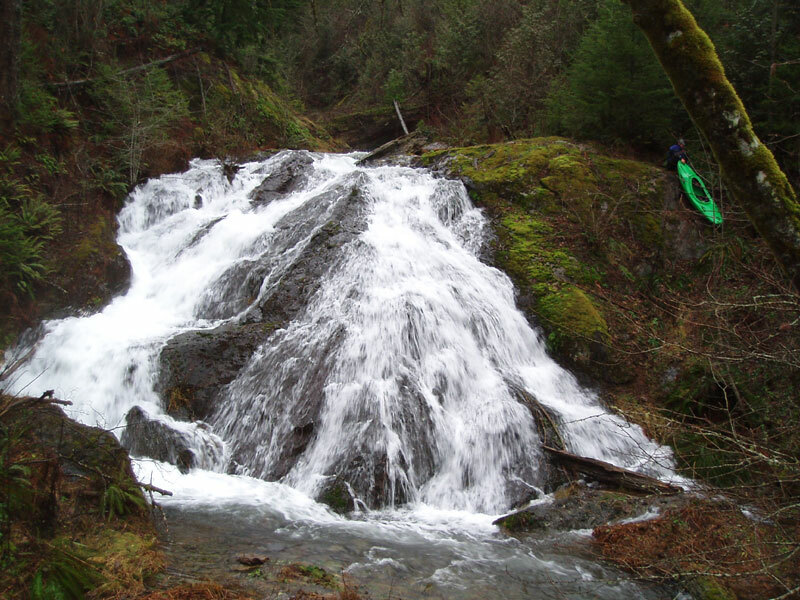 Again, the creek in between the ledges and falls had a very blind/narrow/eddyless/continuous nature with wood, so don't even think about running this one at high water, you've been warned..
Mike Long runs a falls near the confluence with the NW Fork Washougal. Soon we reached the confluence falls and the NorthWest Fork. We were all relieved to see it, because there was sooo much portaging upstream due to wood. We ran every drop except the Hand of God, but we actually portaged probably half of the creek due to wood, all of which was located in the class II-III in between the good stuff. All of that said, I can't really recommend anyone run this creek unless the log situation improves dramatically. That has been known to happen around here, so I guess this creek might be run in the future after some log reduction.. The flow in the Washougal at Washougal gauge when we were on the creek. This was a little low, I think 6,000-7,000 would probably be better, but as mentioned above you don't want to run this one at high water, so 7,000 is probably as high was I would go..